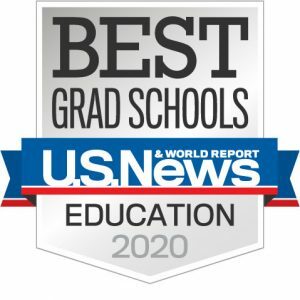 GREENSBORO, NC • MARCH 12, 2019 — U.S. News updated their website’s information about UNC Greensboro’s graduate programs in Education today, highlighting its excellent placement in their 2020 Best Graduate Schools rankings. UNC Greensboro School of Education was ranked in the Top 3 Graduate Schools of Education in North Carolina, and our Counseling and Education Department (CED) was ranked #6 for best Student Counseling program in the nation, making CED the highest ranked graduate education program in the state! Because of these high rankings, UNC Greensboro earned eligibility to display a U.S. News-trademarked 2020 Best Education Schools badge on our web site and in our promotions. U.S. News badges are widely recognized as symbols of excellence in American higher education. 2020 Best Graduate Schools features updated rankings of the six disciplines we evaluate in depth every year — Business, Education, Engineering, Law, Medical, and Nursing disciplines – plus new rankings for Public Affairs and six Health disciplines. We are so proud of this national recognition for our School of Education, and know that it is extremely well deserved. Congratulations, SOE! This entry was posted in SOE. Bookmark the permalink.